We first came across these rings walking through Bologna. 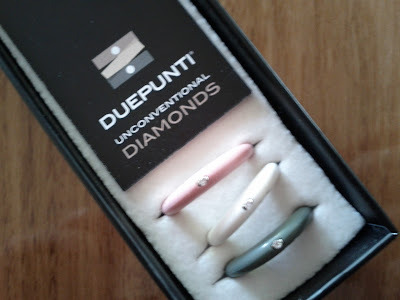 They're silicon with a teeny tiny diamond in them, they're Italian designed (and I think made), they're unconventional and they're just what I always wanted but didn't know it! I've actually been looking for something unusual to replace my engagement and wedding rings with for a couple of years now but everything I find is just so ... normal. These were perfect! Full points to The Sparky for hearing me, for finding the note I made on my phone of the brand name, for sneakily finding my ring size and - most impressively - for finding a place online that he could buy them from (they've hit Europe and the US big time but haven't quite made it to Aus yet). Also, he has this great nack for picking colour combos that I would never choose but that turn out to be perfect.